Davis Coen has always wanted to record an entire album of spiritual music, and with his tenth release, These Things Shall Pass (Soundview), he has finally fulfilled that wish. If you’re a longtime fan of Coen, you’re aware that his musical style encompasses blues, country, soul, and gospel music --- he calls it “contemporary country-blues” --- so this latest release seems like a natural progression in his career. These Things Shall Pass features 12 tracks, eight originals written or co-written by Coen, and four covers of classic traditional hymns. Coen’s readings of “What A Friend We Have In Jesus” and “The Old Rugged Cross” are appropriately reverential. The steel guitar on the former is a nice addition, and the opening cover of “Working For Jesus” (written by Willie Mitchell, recorded by Willie Banks & the Messengers) is sweet and soulful, and the title track, written by Stuart Hamblem and covered by Hank Snow and Johnny Cash previously, ventures toward the country side of the aisle. Coen’s own compositions are all standouts and mix the gospel message with his blues and roots musical style. The acoustic “Stand By You” mixes blues and folk and “Saint Christopher” has a Delta blues feel and vocal interplay between Coen and guitarist Patrick McClary (Billy Joe Shaver), who also features prominently in the rousing “Jesus’ Hand” as well, as co-author and singer. Coen’s “You Are The Onliest (God I Know)” features a passionate vocal performance from the singer over spare keyboard and shimmering guitar backing. 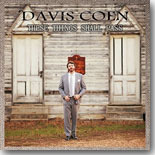 These Things Shall Pass is a great addition to Davis Coen’s already impressive catalog of recordings. This is an excellent gospel album that will appeal equally to believers and non-believers.